Stationed at Amicalola Falls State Park as a ridgerunner, I am privileged to encounter hikers as they begin their hopeful pilgrimage across the backcountry though fourteen states. My job is to ensure they are planned and prepared for their journey, Leave No Trace Principle numero uno. As a recent thru-hiker myself, I know what it takes to be successful and enjoy oneself along the way. My familiarity with the trail is recent and widespread. I made some of the same mistakes at the onset of my thru-hike as others are making, and I find joy in sharing wisdom and experience with them, but please note, there are many ways to trek across the A.T., so you’ll find what works for you. Without further ado, here they are, the top 10 mistakes I see hikers making at the onset of their journey! Every single new backpacker I have encountered while working at the Amicalola Visitors Center the past few weeks is carrying too much food. Most of them know it and admit it. I did it too. We all do, I guess, until we really get out there and get the hang of our routine. Even then, some of us (me) still carry too much grub. So the basic principle is you should plan for 1.5-2 pounds of food per day. Plan a breakfast, a 2nd breakfast or snack, lunch, afternoon snack or two, and a substantial dinner. If you start at Amicalola and walk the approach trail, you are 40 miles from Mountain Crossings at Neel Gap, your first on-trail resupply option. Starting at Springer Mountain, you’re only 32 miles away. At most, you should be carrying four days of food unless you plan to start at a six to eight miles per day pace in which case an extra day’s worth of grub might be needed. Multiply the 4 days by 2 pounds per day and your food bag should weigh no more than 8 pounds hypothetically. Go ahead and give yourself an extra 2 pounds of “comfort food”…candy, cheeses, chocolate, enjoyable stuff! Your ultimate goal (which is hard to nail) is to walk into town having just finished the last of your food an hour or so before. Click here for “Clarity’s thru-hike menu”. Don’t expect any fancy recipes. There aren’t any. You’ll see. The exhaustion after even the best day on trail made ease preferable to effort to me. This is a sample of my daily grub on the trail. Missing is a tortilla for lunch to go with the peanut butter. I’ve encountered hikers in despair over the weight of their full packs who were carrying 3 – 5 liters of water. One liter of water weighs 2.2 pounds, so it’s an easy place to ensure you’re not carrying extra weight. Never on my A.T. thru-hike did I need that much! Three liters may occasionally be needed in case of a drought or in spots during mid-summer, but it’s infrequent. The first miles of the AT are full of regular water sources. 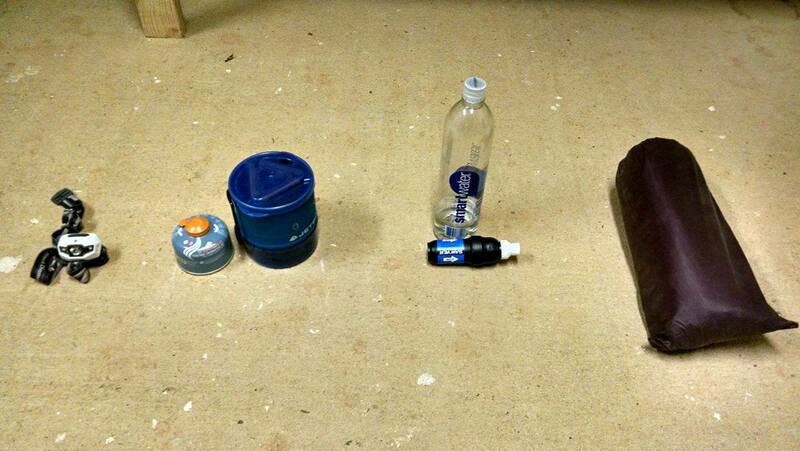 Just be sure to bring something with which to treat your water to increase your chances of staying healthy. Click here for an article on the most common water treatment system on the A.T. On the approach trail, there’s good water 7.3 miles in. I recommend through the night and into the morning of your hike, drink a liter to start the day well-hydrated. Carry 1.5 to 2 liters up the blue blazed approach trail to Black Gap Shelter where you can drink fresh spring water if you need to refill. This is the most common water filter used by thru-hikers on the A.T. Read the article linked above for more information. 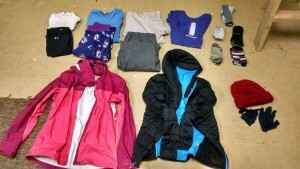 Clothes are HEAVY, so although you want to be prepared to stay warm in cold conditions, you don’t want to carry extras. Unfortunately if you’re starting right now, your pack is going to be heavier due to the cold weather clothes you’ll have to bring. Pack a base layer (thermals or UnderArmor cold gear top and bottom). Pack a pair of warm night clothes. I LOVED my fleece shirt and pants! Pack one pair of hiking pants and one hiking shirt. If it makes you feel better, throw in an extra t-shirt you can wear while washing your clothes in town. Socks – I suggest one warm wool pair for night sleep and two pairs for hiking including the one you are wearing plus 2-3 pairs of sock liners. Don’t forget your rain gear and down coat, one warm hat, and one pair of gloves. Know how your gear works before you leave home. Prior to hitting the trail, I spent time practicing how to put up my tent and take it down, even timing myself for “funzies”. It helped me feel more confident once I got out on trail. Unfamiliar gear can be frustrating. Hikers should also be acquainted with how to use their stove, water filter, and headlamp before starting out. Also practice packing and unpacking your backpack. Put everything in the same place every time, and you’ll feel more organized and be less likely to leave things behind. Start your journey stress-free so that you can reach maximum enjoyment! Seriously, your back and every shred of your body will thank you if you reduce that poundage stress. If a kind soul offers to do a backpack shakedown with you, take him or her up on it! We can all learn from one another. You can take or leave the adviser’s advice, but don’t let ego keep you from possibly learning something you didn’t know. 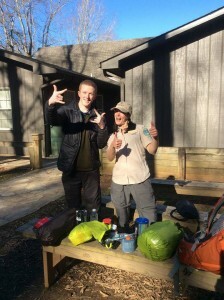 If you start walking with an unwieldy, cumbersome pack, you are committing to carry every pound of it (except for what you eat) through misery and despair 30-40 miles to Neel Gap. Please avoid any temptation to leave your gear strewn about on the trail thinking “someone else will be able to use it”. A majority of hikers out there are in the same boat you are as they begin to learn their way around life on the A.T. A kind volunteer has to carry every bit of that discarded gear off the trail. 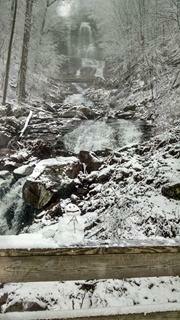 Leave no trace on our beautiful Appalachian Trail. Click here for a video of one of Clarity’s backpack shakedowns. After a backpack shakedown, Jackson rid himself of 11 unneeded pounds off his back! Yeah! The front bench is loaded with unneeded or duplicate items. 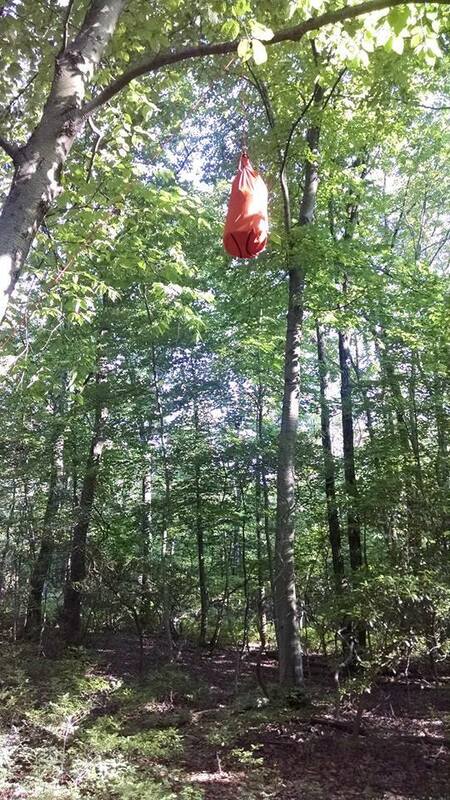 This new hiker rid his pack of 8 pounds of unneeded weight. Ok, let’s not cause a stink here, but nothing can ruin an entire day like encountering or stepping in human feces. Please, please go 200 feet (that’s 80 steps) away from the trail, campsites, and water away from water before taking a poop. Bring a trowel! It’s lightweight and makes digging proper catholes SO MUCH EASIER! Bury, cover, and the earthworms and your fellow trailmates will thank you graciously. Trail karma points for not spreading diseases and for preventing someone else from having a horribly crappy day. Is it a trowel or a trophy? Both. Be a Leave No Trace advocate and carry it proudly! 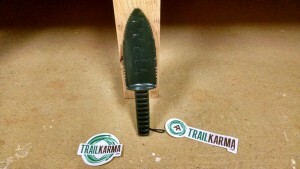 Good Trail Karma will follow. Scary. With the 86 % of all recorded deaths by bear occurring since 1960, it could be surmised that bears are starting to associate humans with food as more and more of us take to the backcountry. Not good for us. Not good for the bears. If a bear is persistent, he gets relocated. If he becomes a nuisance, he could be trapped or killed. Killed for something that’s not his fault. Something WE could have prevented by properly storing our food. Hang bags, bring bear canisters, use bear boxes. Even scarier than the bears are the nibbling little mice who can wreak havoc on a tent or a backpack to get to the delicious scents emanating from inside. Holey gear can quickly ruin your experience. This cool hiker is sporting a bear canister! The Approach Trail is hard! It takes many new hikers off guard. Georgia isn’t an easy state in which to start building your hiking legs. After 2-3 days, there are many sore knees and Achilles tendons that come dragging into the shelters and campsites in Georgia due to pushing too hard at the onset. It is not worth hurting yourself this early (or ever! ), y’all. Go slow and hike your own hike…eight miles of pleasurable walking the first day or so, then ten, then twelve, and so on. Enjoy the journey. Rushing through it too early hurts in more ways than one. Ouch. Sore feet can bring pain to every step. Take care of them! Trail runners are great for summer. Waterproof hiking boots are better for these kinds of cold, wet conditions. 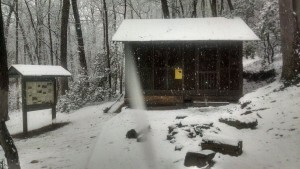 Today it snowed 3-4 inches at Amicalola in two sudden hours. There was never snow in the forecast today at all. Expect snow. Expect wet. Wet, cold feet equal problems. Only 50 miles in, hikers are already complaining of spending more money than they had anticipated due to unexpected overnights as a result of bad weather. When you budget, be sure to add an extra three or four hundred for unexpected expenses that are inevitable. There you have them, the top 10 mistakes ridgerunners observe hikers making at the onset of their journey. Set yourself up for success as much as possible at the beginning. Plan, prepare, and walk. Enjoy the journey! 2015 Appalachian Trail female flip-flop thru-hiker. Passions are dogs, good beer, my motorcycle, and my trail. Life is a journey full of ups and downs. You hold the map. Live it. 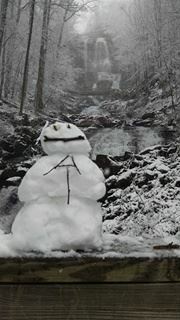 www.AppalachianTrailClarity.com - An A.T. site for newbies and oldies! Great! Applicable to all trips! Hi, Clarity! We met you when we took our daughter to start her hike. She’s in NC now. I was worried about her feet and knees, but she took a needed zero day (originally because of a snow forecast) and it was just what she needed. She took the approach trail with her Dad, brother, sister in law, sister and two friends….and they all made it! There was even a proposal in front of the falls! Thank you for your cheerful and positive attitude at the start of a long journey for my baby girl! So happy to hear the update! 🙂 Just what I needed to hear today. Be sure she’s wearing liner socks under her hiking socks if she’s suffering from blisters. Happy trails! As a past thru-hiker your advise is spot on.